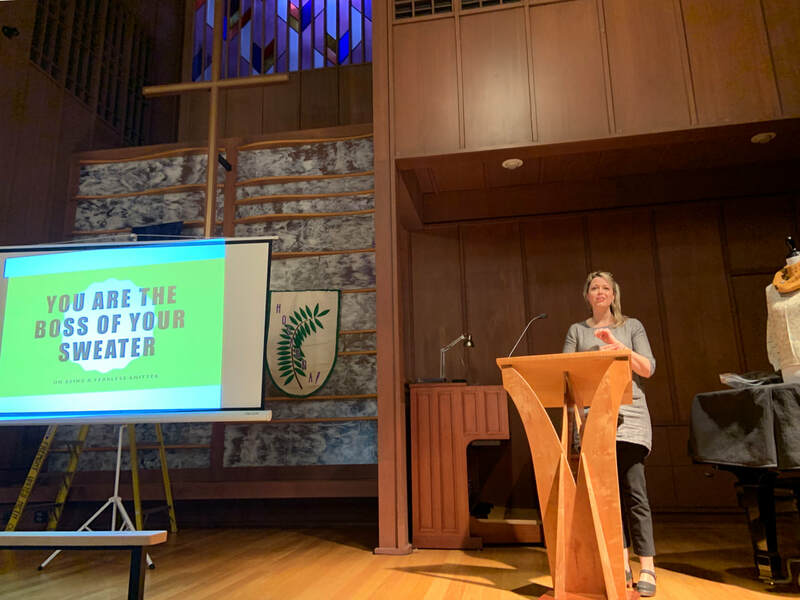 March Meeting Recap: Stitch & Stir Live Podcast! We had a unique and super fun meeting this March! Emme and Samantha of the Stitch & Stir knitting podcast hosted and recorded an episode. 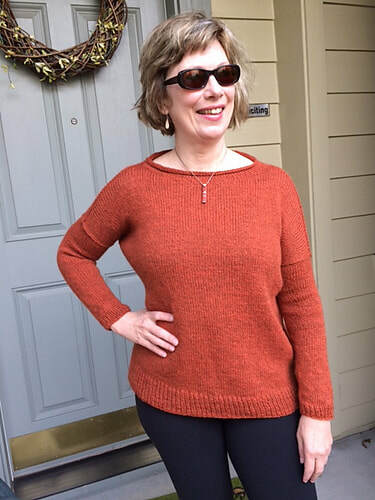 Thank you so much Emme and Samantha for sharing your beautiful knits, embracing our "knitting confessions" (be proud of your knitting confessions!) and playing a game of Gimme Gimme complete with prizes! Join us next month, April 11, to see Marie Green, a.k.a. Olive Knits, present "You Are the Boss of Your Sweater." 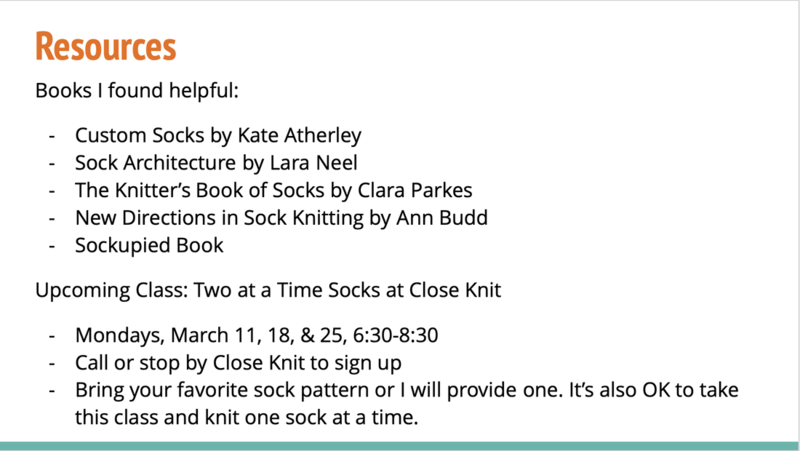 Please note: we will be in our normal meeting space at 6 for social knitting and so that you may purchase Marie's new book, Seamless Knit Sweaters in 2 Weeks, but we will host the presentation in the church's sanctuary. If you purchase Marie's book ahead of time, you may be able to get her to sign it before or after the meeting. Emily Devlin tells us all about sock anatomy. 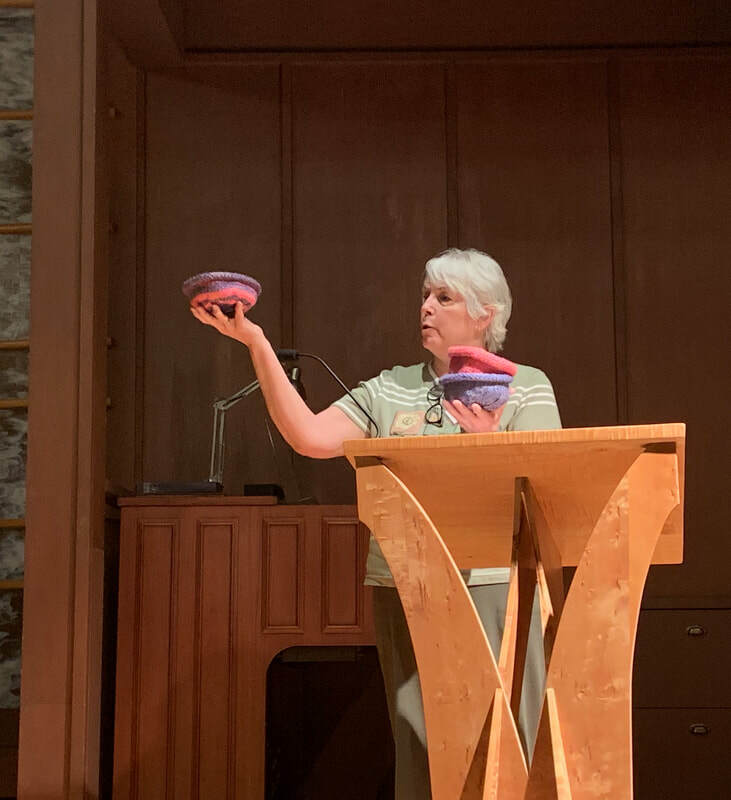 This month, Emily Devlin brought her sock experience and expertise to our program. 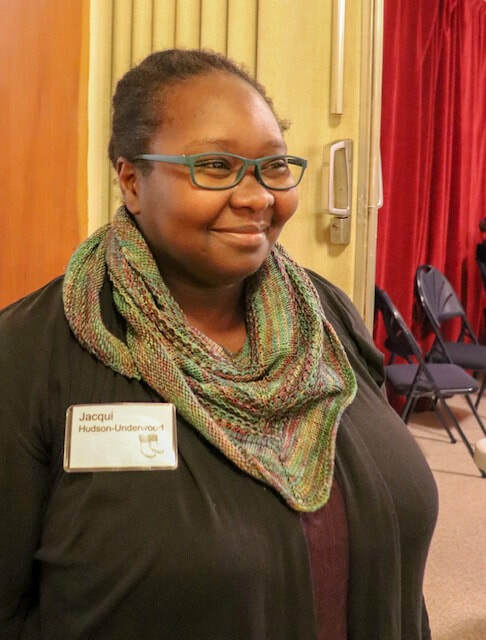 We had a visit from Rose City Yarn Crawl, and recapped our first Diversity Knit Nights. 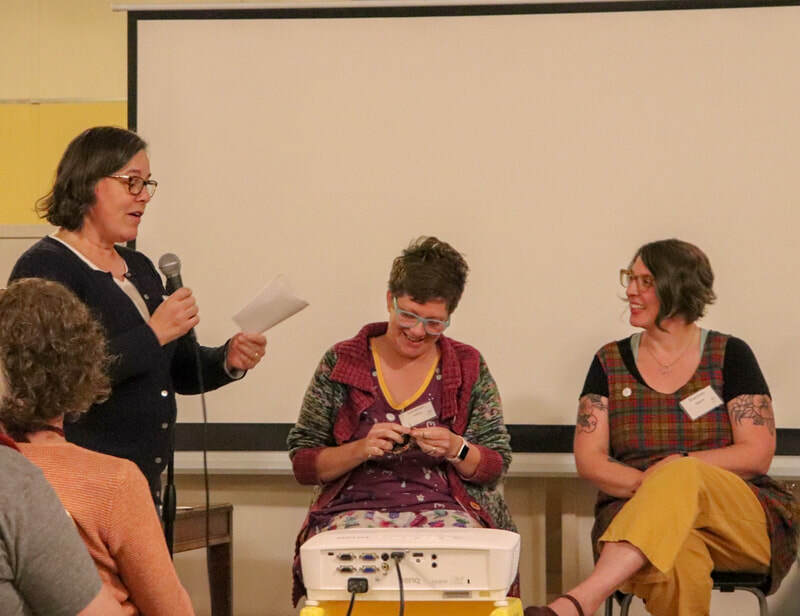 Three board members of the Rose City Yarn Crawl (RCYC) spoke to us about the annual event that celebrates Portland area local yarn shops. It's coming March 7 - 10. Owners from Close Knit (a yarn crawl regular), Blizzard Yarn and Fiber of Vancouver, WA and Knotty Lamb of Forest Grove (two new shops on the crawl), drummed up excitement over this March's crawl. The crawl includes a passport you can print out and get stamped at each shop. Complete passports can be submitted to the grand raffle. Each shop also has a few raffles for giveaway. There's a whopping total of 66 raffle prizes! Shops remain open longer hours so that crawlers can have more chances to visit. Be sure to check out their daily events to see what trunk shows are happening at the shops. This year's RCYC tote was designed by the daughter of Close Knit owner Sally, and it's a cute one! They'll be for sale in limited quantities at the shops. This past Monday, we hosted our first "Diversity Knit Night." 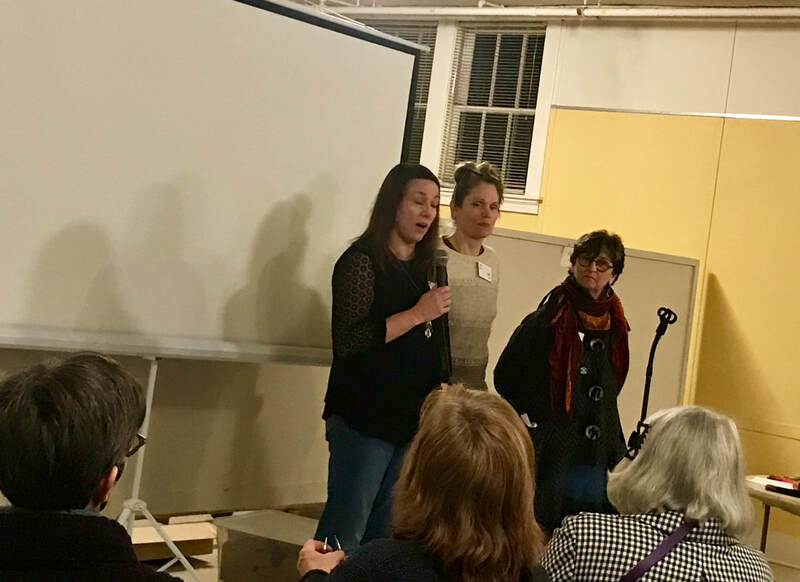 Five guild members attended, including two board members (Board President Margaret and Communications Chair Angela) and business member Lori Patterson of Abstract Fiber. 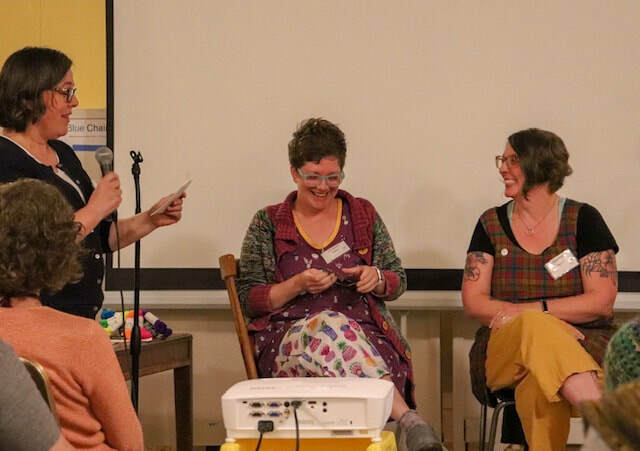 Our goal with these knitting gatherings is to provide a space for interested individuals to discuss how to better include black, indigenous, and people of color (BIPOC) in the guild and Portland's greater fiber community. We hope to foster a supportive atmosphere; we're here for each other. At the end of each knit night, we aim to leave with an action item. For this first meeting, we started an ongoing list of free educational resources (literature, podcasts, videos, etc.) as well as Makers of Color to follow on social media. Each of us will chose a resource to discuss at the next meeting. View or add to the list here. 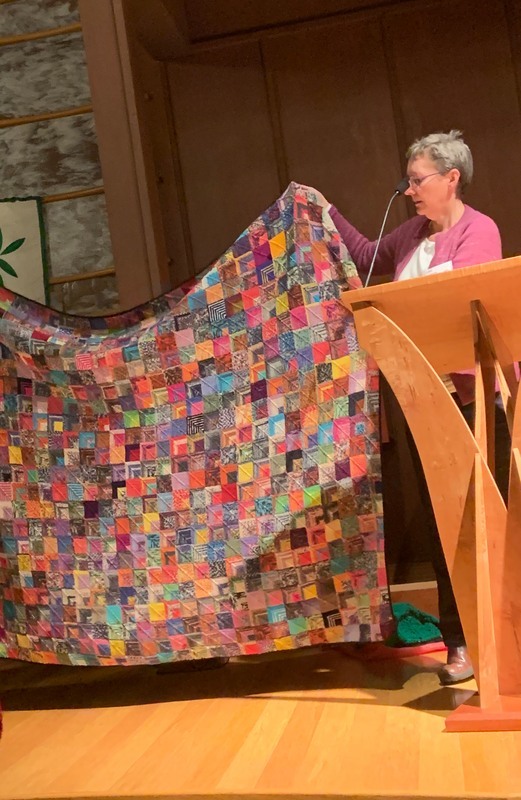 We are also wanting to discuss what we can contribute to events like World Knit in Public Day, groups or clubs to invite to PKG meetings, charity opportunities, and other ideas you have. We meet the 2nd Monday of each month at Fremont United Methodist Church in the Bob Nelson room, through the front doors of the church off of Fremont. 6:30 pm. This is a less formal gathering than the meetings, so feel free to join when and if you can. Non-guild members are welcome. We are looking into how this might translate to a Facebook or other digital group for those who can't make it in person. Next meeting is March 11 at 6:30 pm. Why does Emily Devlin (Fairweather Knitter) love to knit socks? A myriad of reasons, not limited to their customizable character. 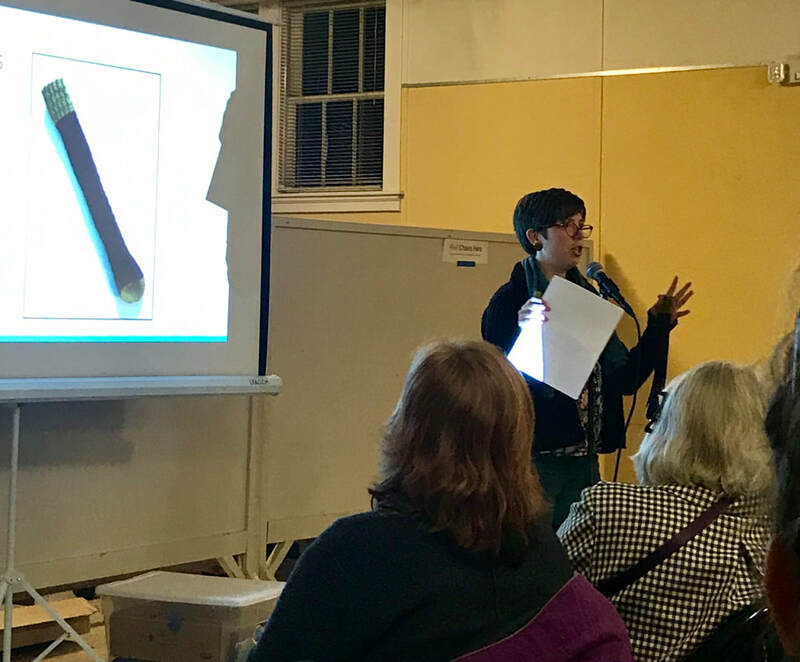 Emily walked us through every piece of a sock and the advantages of each decision one can make when knitting their own socks. 1. Yarn: thickness, twist, and fiber content. A tighter twist and a wool blend with silk or nylon usually yield a sturdier sock. You can also reinforce areas of your sock that wear down most on you. 2. Gauge: Emily recommends a dense gauge for better durability. If you don't do a gauge swatch, be sure to try on the sock as you go. 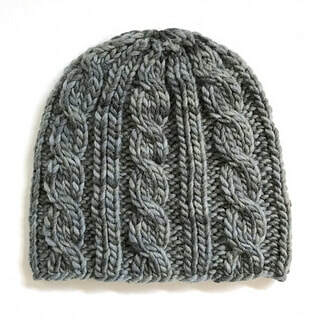 If you do knit a gauge swatch, knit one using an I-cord-like technique with loose floats in back to obtain a swatch more similar to the in-the-round result. 3. 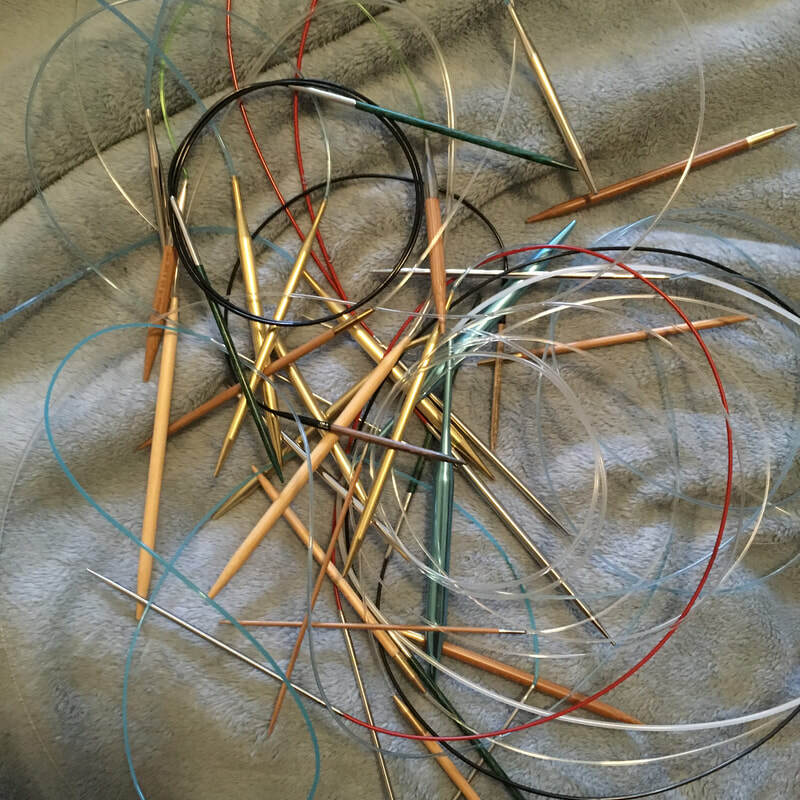 Needles: Do you do double-pointed, magic loop, or two circulars? If you suffer from "second-sock syndrome", try the magic loop method on extra-long circular needles so that you can knit both socks at the same time. If you simply want a stockinette knit, you can zoom around on very short circular needles. For DPN fans, maybe the addi FlexiFlips appeal? 4. Direction: Are you on the toe-up team or the cuff-down committee? Deciding where to start can be determined in part by how you wish to bind off. While any part of your sock can be reinforced, like where your gait wears down the fabric most, a slip-stitch heel technique helps. 6. Toes: Depending on how you want the toe of the sock to look or fit, and depending on where you start (toe-up or cuff-down) there is the Wedge, Round, or Spiral that is like the top of a hat. Emily brought cuff swatches for a hands-on look at the stretchiest bind offs and cast ons. 7. Cuffs: Stretch is key when it comes to cuffs. When you cast on at the cuff, consider going beyond the long-tail cast on and trying stretchier techniques like the Old Norwegian (also known as German Twisted) and the tubular cast ons. For toe-up socks, stretchy bind offs to consider are: Tubular or Kitchener, Doubled or Russian, Sewn, and Jeny's Surprisingly Stretchy. Whichever you use, note that a 2 x 2 rib tends to provide the most stretch on the whole cuff. The longer your ribbed cuff, the more stretch you get. Fancy cuffs, like picot or cable, aren't as stretchy. Keep in mind as well that, tight socks don't necessarily mean that they will stay up on your leg. A right-fitting sock, not too tight or too loose, will stay up while being worn. 8. Stitch Pattern: This is the fun part. If you're breaking away from a written pattern, consider using a stitch dictionary as inspiration for your own designs. Go with a pattern repeat that works evenly with the total number of stitches (if you have 60 total stitches, then chose a pattern with a repeat of 5 or 10 stitches). 9. How Many at a Time: As mentioned above, you can use an extra-long circular needle to knit both socks at the same time, which ensures the socks will be identical (or at least as close as possible). Thank you, Emily, for a great presentation! ​We had yet another gorgeous Show and Tell, including those by new members - Welcome! 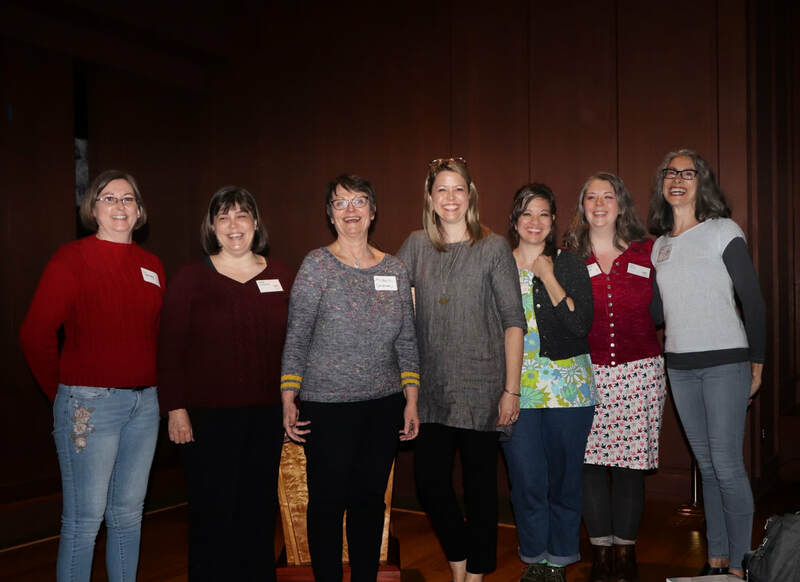 We love seeing new members, newer knitters, and visitors share their projects. Catch us next time, March 11th, for the Stitch & Stir podcast with Emme and Samantha where they will be recording a show. Jamie MacCarthy, community and customer service maven of Brooklyn Tweed, educates us on the company history. 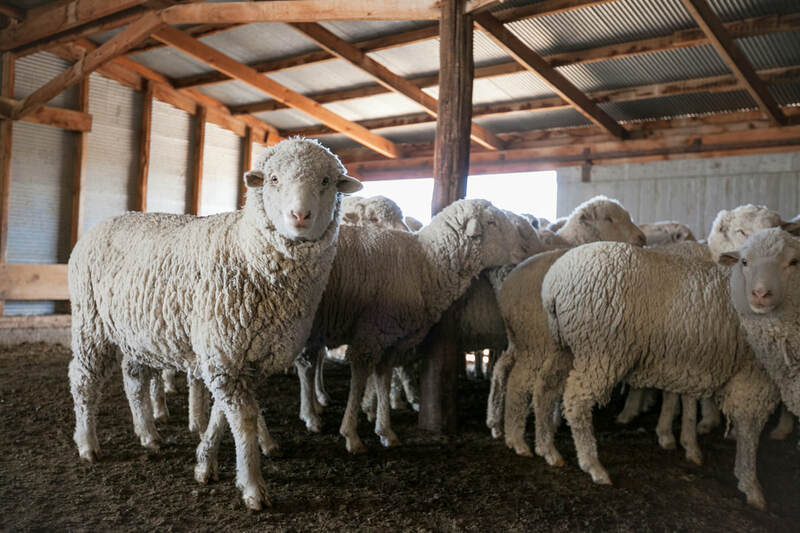 Our last meeting of 2018 brought us one of our favorite business members, Brooklyn Tweed, to talk about the experience of working with the local, breed-specific yarn company. We also had an amazing giveaway and a some tips on how to save your precious woolies from moths. 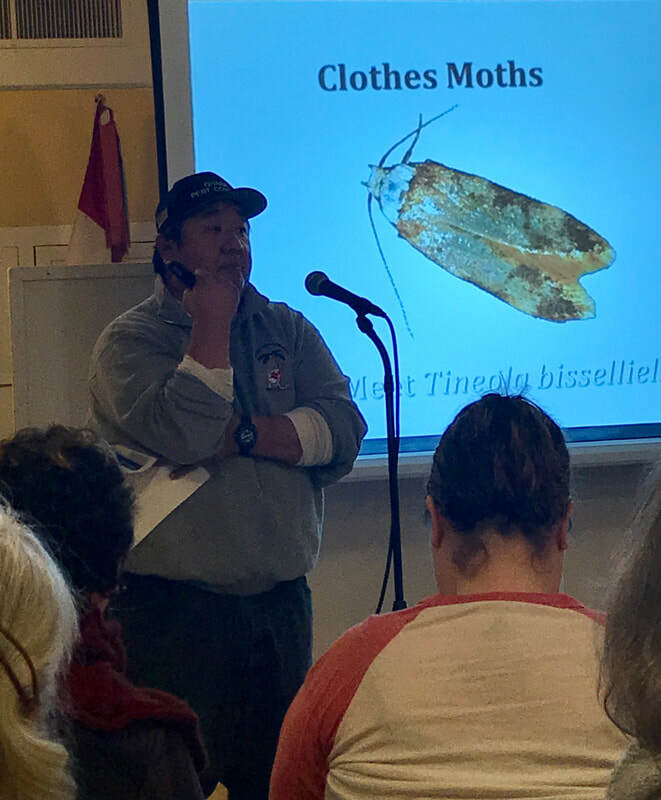 Jeff from Ohana Pest Control shared his professional tips for keeping your woolies well. 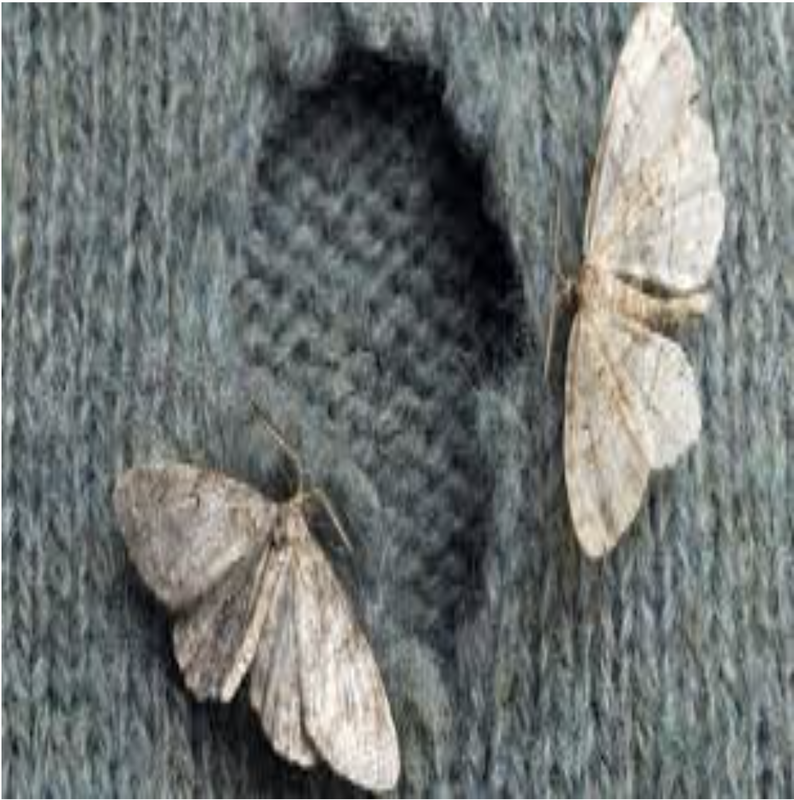 Scents like peppermint, cedar, lavender, and mothballs deter moths from laying eggs in your yarn and knitwear. If you bring home natural fibers from a thrift store or yard sale, store them in your freezer for at least 12 hours before integrating them into your stash. Every detail of Brooklyn Tweed, how they source their materials, craft designs, and the feel of a blocked swatch, reflects a certain kind of passion. Customer and Community Relations expert Jamie visited us to talk about the story and experience of one of our favorite business members. 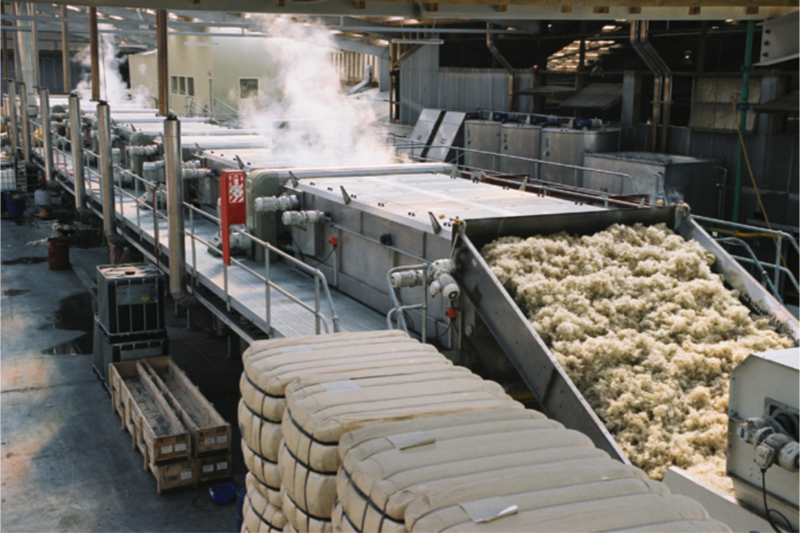 Where Did Brooklyn Tweed Begin? Its namesake comes from the New York City borough where founder Jared Flood first started a blog about his knitting adventures. With a reverence to Elizabeth Zimmerman, he became obsessed with knitting and yarn making, soon having one of his designs on the cover of Vogue Knitting. 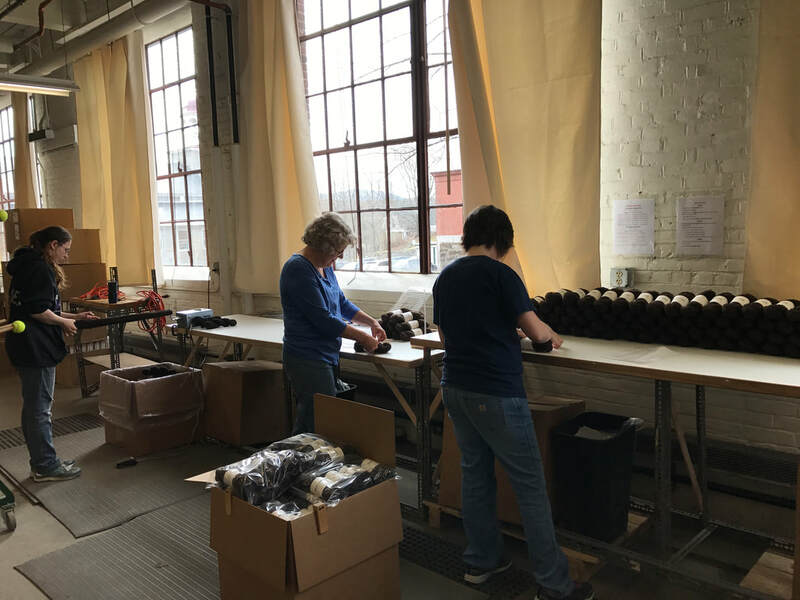 Women wrapping skeins of Shelter by hand at the historic mill in New Hampshire BT works with. 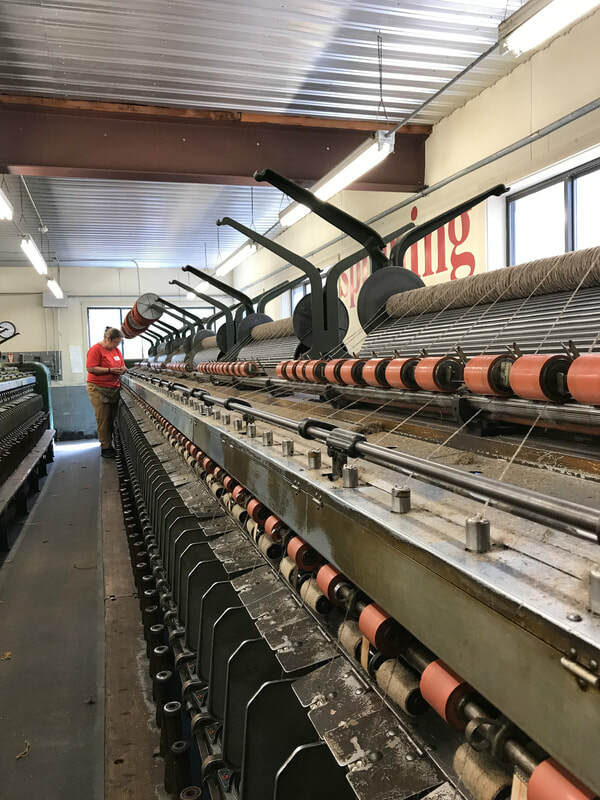 Brooklyn Tweed 's mission is to "develop and manufacture breed-specific yarns that support domestic textile production—designing, sourcing, dyeing and spinning our yarns within the USA." Jamie took us on a quick journey from sheep to skein. Targhee-Columbia sheep, an American cross-breed, in Wyoming. Woolen spun yarn like Shelter start on these cuties. Ready for spinning in New Hampshire after a visit from the dye house in eastern Pennsylvania. What Is It Like Designing for Brooklyn Tweed? With a team of expert knitwear designers like Gudrun Johnston and Norah Gaughan, Brooklyn Tweed patterns get a lot of love. To create collections like Wool People, the design team gathers for a retreat in which to deep dive into brainstorming and developing. Sounds like a dream, right? From there, design and marketing coordinators work with Jared and company to bring new patterns to you. 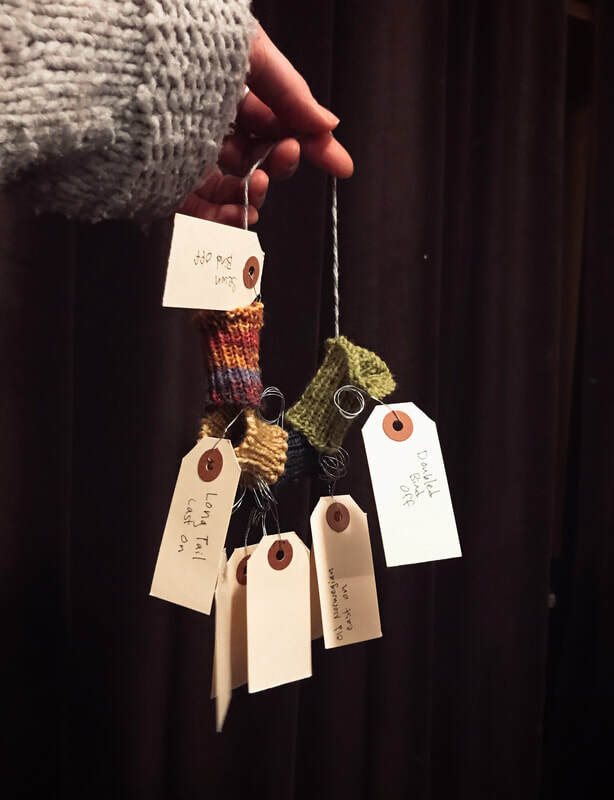 To show their appreciation, Brooklyn Tweed brought mini skeins of Peerie for each member. 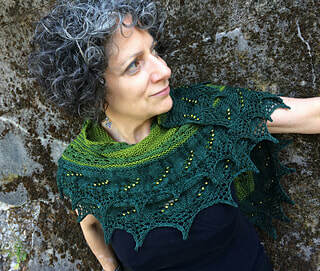 When you knit it up, be sure to bring your FO to Show and Tell! 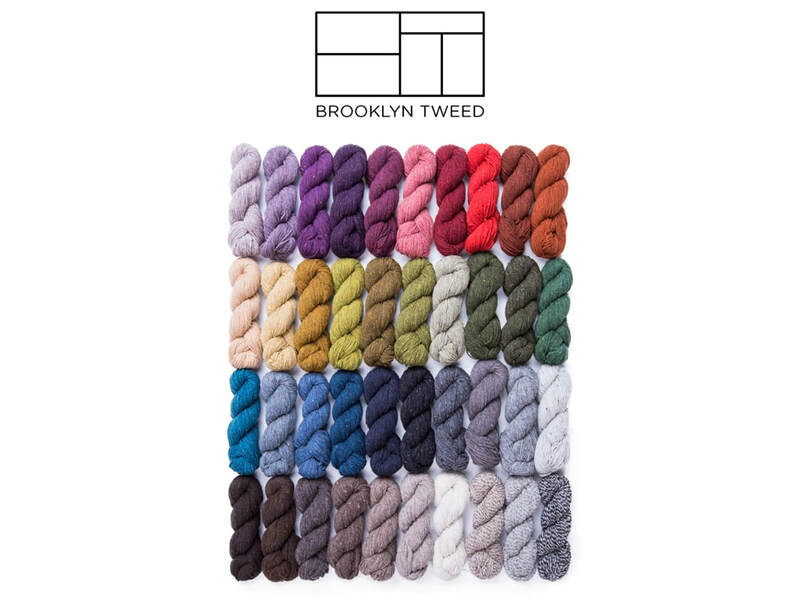 Thank you to Brooklyn Tweed for a wonderful program. Our members make the most amazing things. 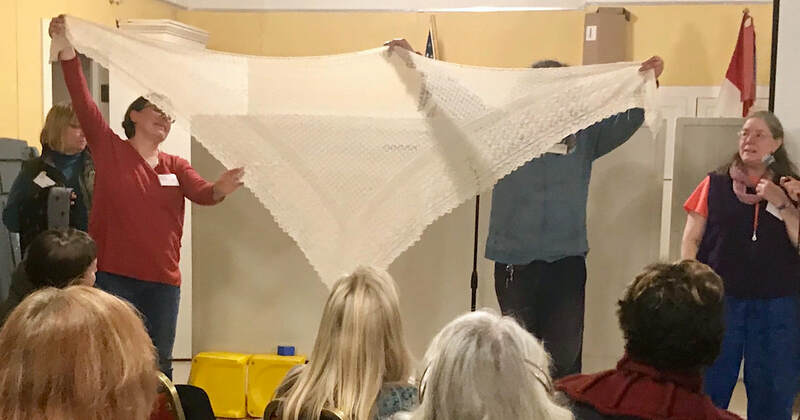 This gorgeous lace shawl was knit by a member (on the far right with the mic - holler at us so we can properly acknowledge you!) for her wedding. 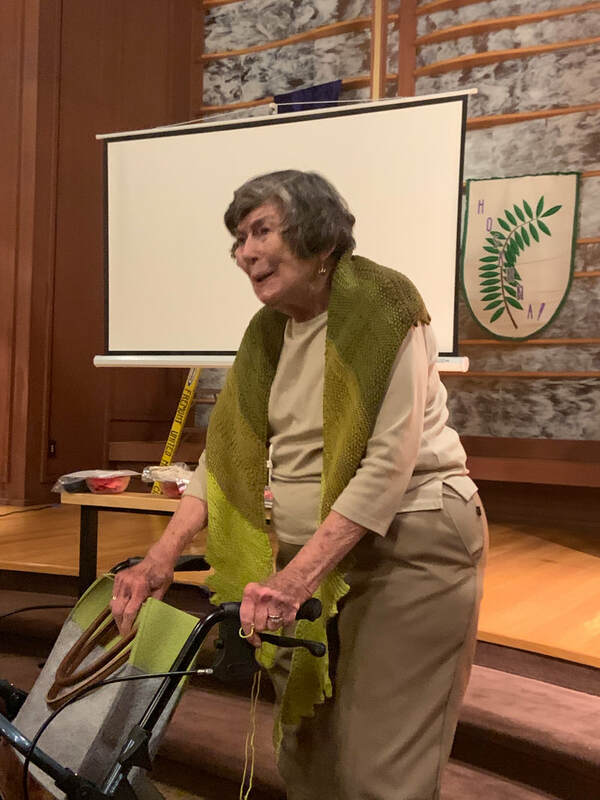 Emme Von, co-host of the Stitch and Stir podcast and March program co-guest, won a blanket's worth of Noro in our raffle. Yes, you read that right. 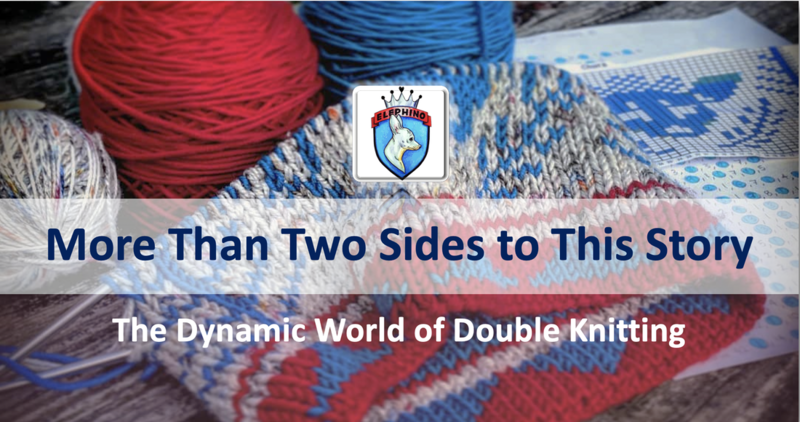 Join us in 2019 for a review of Double Knitting by Renate Yerkes! This month was full of fun and warm coziness. 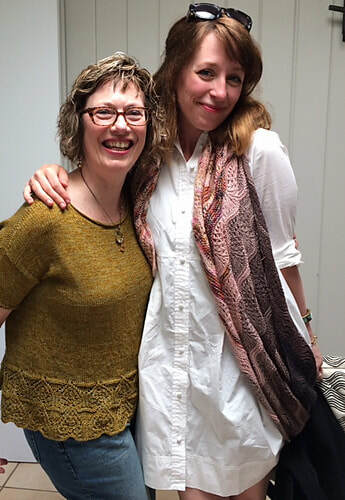 We welcomed fiber besties and collaborators Lorajean Kelley of Knitted Wit and designer Shannon Squire. 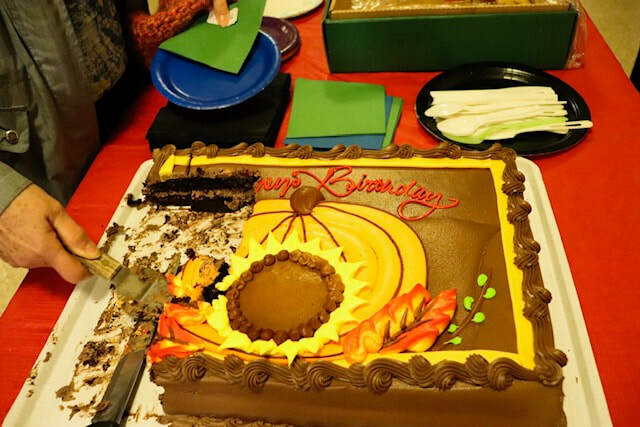 And, we got to show our appreciate to Sunshine Division. Not to mention, it was our 1st birthday! We can hardly believe what an amazing year it's been with you all. We hope you join us again in 2019! Jason and Avery from Sunshine Division paid a visit to receive your hand-knit hat donations. We are so proud to stand with Sunshine Division, and the generous and talented knitters you are made over 200 beautiful hats for their charity. Thank you so much all! Jason, Avery, and Margaret with your donations. Fiber besties and frequent collaborators Lorajean Kelley and Shannon Squire brought sparkle and unicorn vibes. Lead by Program Assistant Annette, the pair answered questions about the work they do together and how it knits into their strong friendship. Annette grills Lorajean (Knitted Wit) and Shannon (Shannon Squire Designs). In 2008, while Shannon was co-owner at Twisted, Lorajean paid a visit to sell her hand-dye yarn (Knitted Wit!). Lorajean plopped her colorful skeins down on the table, and a relationship was born. How do they stay such good friends? The key to their consistent friendship is to give each other space, they said. Allowing each time to do their own thing results in each of them coming back to create together even better. 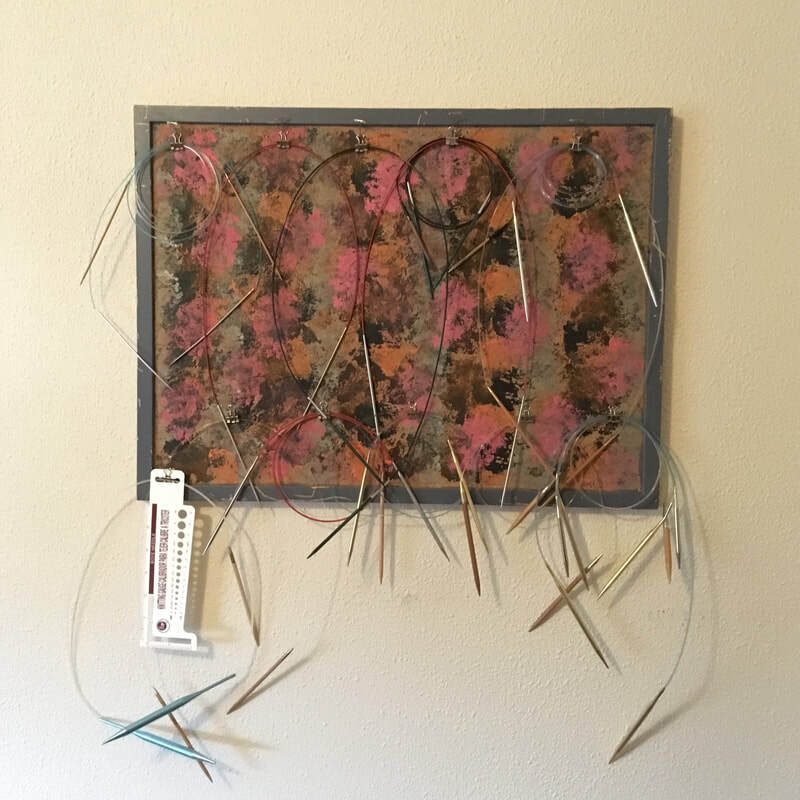 What's most important to them as fiber artists? Community. Portland has a close knit community (pun intended), and it has a certain vibe and enthusiasm that one can't really find anywhere else. Both Lorajean and Shannon love this community, and intend to keep helping to foster it. ​Within that community are people and causes they care about. Knitted Wit's HerStory Sock Club and National Park inspired colorways, for example. What was your favorite part of their conversation? Shannon Squire's sock designs on her father's handmade wooden sock wheel. Fun fact: Shannon's father makes wooden sock blockers and the incredible sock wheel above. The pair had yarn and patterns for sale. If you missed out, be sure to visit their Holiday Market on December 1, which will have wares from JaMpdx, two glass makers, Chickencoop Botanicals, Hanks in the Hood, and a Sample Sale from Shannon Squire Designs! Liguria by Katrin Schubert knit by Kimberly. From official Show and Tell to discovering amazing projects around the room, here are some of your FOs! Amy in her Stay Soft Shawl. If you don't recognize Amy from our monthly meetings, then you've probably seen her work. In addition to a knitter, Amy is a talented graphic designer who contributes to our social media content and who designed our cool postcards! I grew up in Wyoming and from a pretty young age spent a lot of time in my room making all sorts of little things. I moved to Missoula, Montana after college and this is where I first learned to weave and knit at the lovely LYS Joseph's Coat. I eventually started working there and teaching weaving and knitting classes. I then spent a few years in NYC getting my second degree (in graphic design) and working in advertising before moving to the west coast. 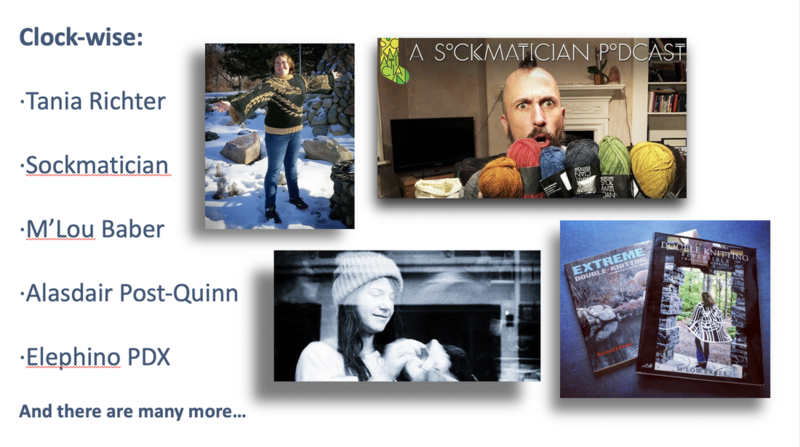 Here I'm a graphic designer and a very obsessive knitter. I'm definitely a process knitter, doing it more for the meditation and mindfulness than anything else. I also love how knitters are never bored or wasting time--we always have at least one small project with us in case we get stuck somewhere, right? And of course I also love the community, the problem-solving, the materials, the patterns, the history. Oh yeah, and wearing all those finished projects! Let's see. Haha. So many things, but the main ones are: Carbeth Cardigan by Kate Davies, Jared Flood's Nehalem sweater and Tolt's Olallie legwarmers by Rachel Kieselburg. I'm dying to start: Melissa Wehrle's Truss cardigan, Madder's Uniform cardigan and something with my plant-dyed Icelandic wool (I'm thinking Melanie Berg's Rainshadow shawl, once it's released). What’s the first project you even finished? Green Mountain Spinnery's Rosemary Sweater. 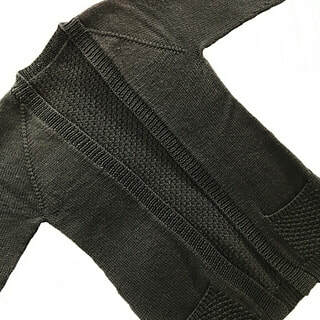 It was a roll-neck pullover, knit in the round, with a little cable at each shoulder. Blue Galway worsted. Unfortunately I don't have it anymore, but it actually kind of turned out ok. That was 20-something years ago. Yikes! What’s your latest knitting obsession? Starting. New. Projects. And also Laine magazine. You can find Amy on Ravelry and Instagram as amypiel. 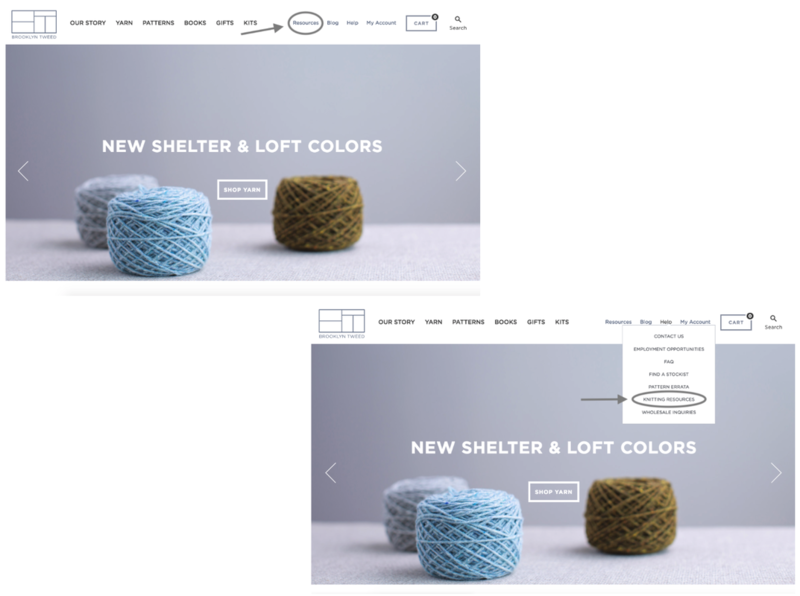 This month, we had web tips from two members who are super active in Portland's fiber community. And, we were inspired by designer Sivia Harding. 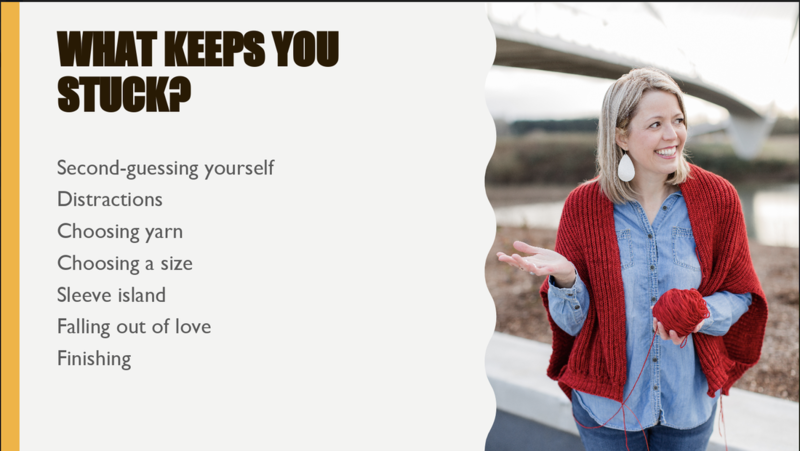 If you need something that your LYS (cuz nothing's like your favorite LYS) doesn't readily have, Ravelry may save you. Start on Ravelry's Yarn page, follow Emme's steps below in the images, and once you've found what you're looking for, reach out to the seller. P.S., Emme is also the co-host of the Stitch & Stir podcast. Check it out next time to sit down to knit. Jamie MacCarthy, Customer and Community Relations for Brooklyn Tweed, gave us a glimpse of the local fiber phenom's growing Resource Library. 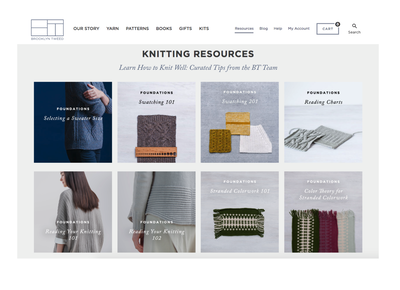 Representative of their passion for wool, knitting, and design, the Resource Library is a rich hub of foundational information for knitters of all levels. Bookmark articles for later, find a tip if you're in a snag, or get lost exploring the thoughtful content. A great one is Selecting a Sweater Size. It includes a downloadable worksheet for calculating ease. 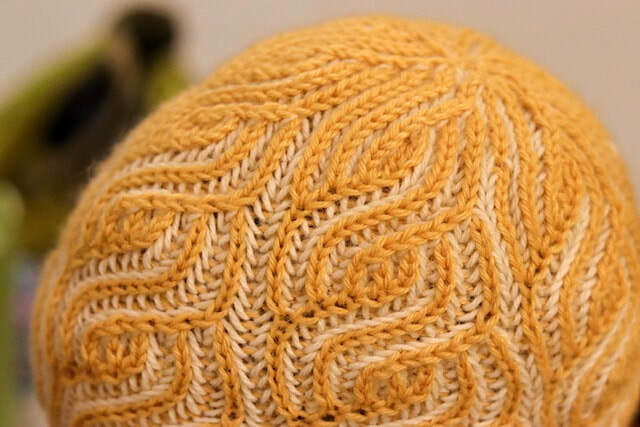 For more discussion, join the Brooklyn Tweed Fan Club on Ravelry. How does she get her inspiration? From nature. And, how does she go forward with one color or texture combination over another? Well, there's looking at complementary colors and designs. But, it's more about trying things out, and, most of all, going with her gut. 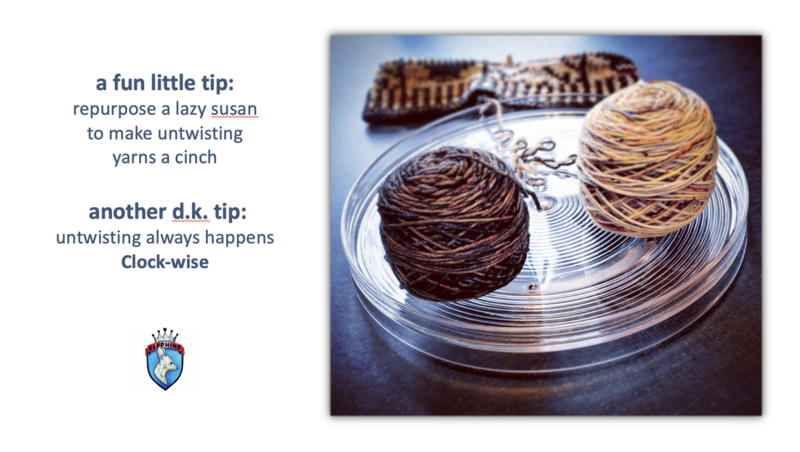 Sivia encourages us to go with our own instincts when choosing bead-and-yarn combinations. When playing with ideas, consider how a project will look up-close versus far away. And, be ready for the unpredictability of yarns and beads. Elements that look one way alone may take on a totally different mood when together. Sivia relies much on Japanese beads, and has an affinity for metallics. Japanese beads, she says, are treated in a similar way as many brands treat natural yarns. Toho Beads and Miyuki Beads are great resources for online. Craft Warehouse in Gresham and Beads at Dusti Creek in Portland supply great beads and opportunities to see them in person. Sivia suggests size 6 beads as great to start with and to try and view the beads outside of their plastic packaging to get the best idea of what they'll look like. What beading adventures do you think you'll take after Sivia's program? Friends from Sunshine Division will be present to collect the amazing hand-knit hat donations you have given. We will also hold a raffle for those who donated. Board Elections will take place for the positions of President/Chair, Program Chair, and Volunteer Coordinator. And, fiber besties Lorajean of ​Knitted Wit and Shannon of Shannon Squire Designs will speak on collaboration. We're excited to host our first destash sale and brunch potluck! Our regular meeting place: Fremont United Methodist Church, 2620 NE Fremont Street, Portland. Everybody! Do you want to sell some yarn from your stash? Then come. Are you interested in seeing what others are selling and maybe interested in picking up a skein or a sweater quantity? Then come. Are you just interested in hanging out and knitting while enjoying the company of other knitters? Then join us! WHAT'S THE DEAL WITH THE SALE? It's a silent auction. Bring your yarn and fill out our form that sets the minimum bis and notifies potential buyers what forms of payment you can accept (cash, check, PayPal, Venmo or other payment app). Then others can browse and bid on yarn. Bids stop at 11:00 am and then buyers and sellers can settle up. All transactions are between the buyer and the seller; the guild does not participate in the sale. There is no cost to sell yarn at the Destash Sale. HOW DO I GET A SALE FORM? If you didn't pick up a sale form at the meeting, we will have them available Saturday at the event. If you want to get them filled out before hand, download one here, or just shoot us an email at puddletownknitters@gmail.com and we'll send you the form for you to print out. WHAT'S THE DEAL WITH THE BRUNCH? The guild will provide coffee and tea, and plates. If you want to be super helpful, you can bring your own coffee cup and utensils. Our lease with the church does not allow for alcoholic beverages, but mocktails would be delightful. That would be great! Email us at puddletownknittersguild@gmail.com if you can help set up at 8:15 am, or stay a few minutes after the sale and help clean up. Our latest Member Spotlight is on Kim Winter, our Board Volunteer Coordinator. 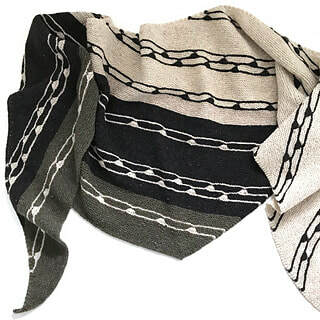 As a joyful and passionate sweater knitter, Kim "knits about 10-12 sweaters a year," she states, "with the addition of about 3-4 shawls, and an occasional hat or pair of mitts." Now, that's awesome! 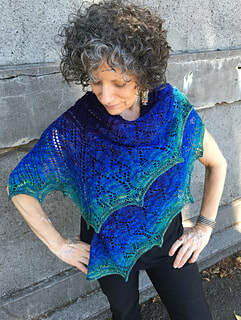 ​My enthusiasm for knitting grew following the introduction of Ravelry and I have spent countless hours chatting, participating in online and in-house KALs, testing designs, and posting pictures. As a speech language pathologist specializing in birth to age 5, my enthusiasm grew even more when I retired from work about a year ago. But I am not tired! Over the past year, my fervor for knitwear has grown exponentially and I plan to teach sweater knitting classes and have a pattern for a video tutorial planned for the future. What got you started knitting? I learned to knit about 26 years ago after moving to Portland and getting married. Prior to that, I was an accomplished sewist. I learned to knit from a wonderful knitter named Kathryn Creswell at a little shop called Spindleshanks in NW Portland. ​I am an avid OSU Beaver football fan and during the season I love to knit in front of the TV or at Reser stadium and knit while I yell. What’s your biggest knitting victory? I have been over the moon meeting different designers at workshops this year including Thea Coleman a.k.a. Babycocktails and Caitlin Hunter a.k.a. Boylandknits (Check out Kim's Tegna top here). Being in their presence has been awe-inspiring. What do you want to learn more about in knitting? I am tinkering with knitwear design and have a couple of sweaters in mind and on paper for the future. Kim's version of "The Easy One" she adapted from Nele Redweik's program "Change the Gauge"
I am an accomplished sewer. I have taken more sewing classes this past summer and have sewn a canvas/leather backpack, an easy top, a modified dress, and I made leather sandals. Find Kim on Ravelry and Instagram as Dreamknitgirl. If you want to be featured in our Member Spotlight, email us at puddletownknitters@gmail.com!